In 2-quart saucepan, bring water, butter, sugar and salt to a boil. Remove from heat and add flour all at once. Mix well. Return to heat and cook, stirring with a wooden spoon, until mixture dries and comes away from the side of the pan. This could take up to 5 minutes, but should take at least 2 minutes. Again remove from heat. Add one egg to mixture. Beat with electric mixer for 1 minute. Add remaining eggs, one at a time, mixing in each for 1 minute. Preheat oil in Presto® electric deep fryer. * If using an adjustable thermostat deep fryer, set at 375°. Drop rounded tablespoonfuls of batter into the hot oil. Cook until puffed and golden on both sides. Drain on paper towels. 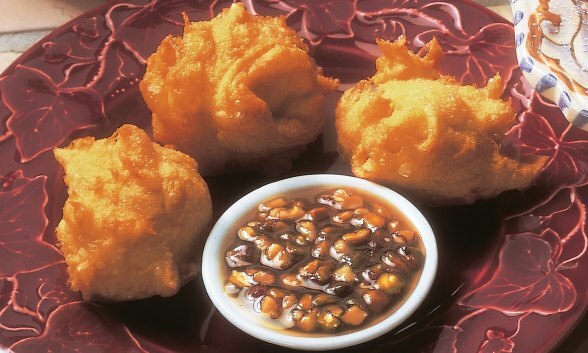 Serve warm Beignets with Orange-Honey Nut Syrup (see recipe below). In medium saucepan, bring honey, water, sugar, cinnamon stick and lemon juice to a boil. Continue to boil, uncovered, until syrup is reduced enough to coat the back of a spoon, about 10 minutes. Remove from heat and add orange flavoring and nuts. Let cool to warm before serving with warm Beignets.